As Ross’ mother, I consider the opportunity to write this letter a privilege. I, of course, could enumerate his good qualities such as his courteous demeanor, his grateful spirit, his resourcefulness, his many accomplishments, and so on. However, I’ve decided the best way to explain why I feel he is deserving of the title of “Eagle Scout” is to share with you a true story. About five years ago, our family was returning to Georgia from Pennsylvania after a family vacation. We exited the interstate to grab some lunch. We came to the top of the ramp and stopped as the light was red. When the light changed to green, my husband pulled into the intersection to make a left turn. All of a sudden, I heard the crunching of metal and felt our world go into slow motion as we had just been T-boned and our van was being flipped on its side. I was in the front passenger seat and looked toward the back seat to find Avery, Ross’ younger sister, still buckled in her seat while Ross was sitting on the broken glass as he had been catapulted from his seatbelt. Everything was very still for a minute until strangers were all gathered around trying to help us out. It was at that moment when Ross took charge. I literally watched him perform what I later discovered was a “self check”, before he calmed Avery down and told her he would take care of her…which he did. He unbuckled her seat belt and made sure she got out of the van before he crawled through the smashed window himself. We were taken to the nearest hospital for more tests. A police officer came to the hospital to give us a copy of the report. As we all talked, and answered questions, the police officer ALSO asked Ross if he was a Boy Scout. I’m not quite sure what made him ask that question, but I AM sure that it made me feel proud of him and for him. This story coupled with all the badges he has worked so hard to earn in addition to the well designed and executed Eagle Project he managed, definitely gives me the confident joy to recommend Ross Copenhaver as an Eagle Scout candidate. He is in my view what car enthusiast call a “sleeper” – he is quiet and low key, but always rises to the occasion with great decision making, a sense of purpose and steadfast confidence. He is indeed a very nice and polite young man. Truly the embodiment of what we expect from an Eagle Scout. As a patrol leader, Ross was always attentive to the scouts in his patrol. He was always encouraging them to be the best that they could be and lead by example. I recall one camping trip to North Georgia where we worked on the Geocaching merit badge. Ross, enthusiastically lead the group up the mountain from 1,800 to 4,000 foot elevation to locate a hidden geocache. Many wanted to give up, but Ross encouraged them not to give up and they were successful in locating the hidden geocache…He has been a great scout and addition to Troop 379 and I know he will be successful at whatever he does. 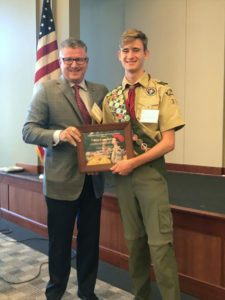 For these and other examples of his exemplary Scouting, Ross was honored earlier this month at a meeting of the Board of Directors of the Atlanta Area Council. Scout Executive/CEO Tracy Techau and the Board of Directors would like to extend their congratulations once again to Eagle Scout Ross Copenhaver of Troop 379.